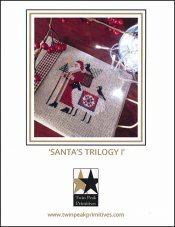 Santa's Trilogy 1 [W6208] - $12.00 : Yarn Tree, Your wholesale source for cross stitch supplies. Cross stitch pattern by Twin Peak Primitives. Santa is coming to town with a new helper this year....Mr. Sheep. Decorated with a beautiful quilt block blanket & a crow on his back, he is ready to help Santa! No peaking into Santa's basket to see all of the goodies he is carrying! Stitch count is 58W x 57H.